An Exeter attraction that can be appreciated whatever the weather. The Royal Albert Memorial Museum and Art Gallery is a world class museum with an assemblage of illustrious displays and collections from all over the world. With FREE entry you can also visit the museum as many times as you like. And don't forget to say hello to Gerald who's now been on hand for 99	years! On the 15th December 2011, The Royal Albert Memorial Museum (RAMM) re-opened to the public after a multi-million pound refurbishment. The work, which took over 4-years to complete at a cost in excess of £24 million has re-established the museum as one of Exeter's premier attractions befitting for the 21st century. Construction of the The Royal Albert Museum first started in 1865 when the first foundation stones were laid. The original Victorian building was finally completed in 1869 and has remained almost unaltered over the years. However, to house the growing collections it became necessary to expand and add extensions towards the end of the 19th Century. The later in 1898 was opened by the Duke (King George V) and Duchess of York (Queen Mary). This was also when the museum was granted its royal title of the Royal Albert Memorial. The Museum is located in Queen Street close to Central Station and the High Street. It can be visited 10am to 5pm every day except Mondays and bank holidays and is free to enter. With this dynamic transformation and modernisation programme completed you can now enjoy the fabulous displays, collections and exhibitions throughout the building. When entering the museum's main doors via the Queen Street entrance you are greeted by a statue of Prince Albert. 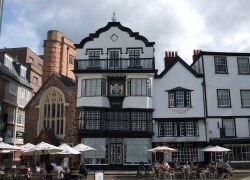 A right turn will take you to the local history section, here you will be able to get a real feel for how the city of Exeter began and continued throughout the ages. Large presentation rooms are dedicated to Exeter and Devon with exhibits, displays, a giant screen, and other screen based inter-activities. 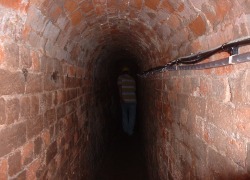 It starts with the remains of prehistoric Devon and continues up to Exeter in the 19th century. One of the showcases contains a fine display of a wooden model constructed in 1824 by Caleb Hedgeland (a local builder). This expansive artefact shows how the city of Exeter was in 1769 before the gates were demolished. If you are local or a curious visitor you can spend ages on this intricate display figuring out the various streets and areas of Exeter. 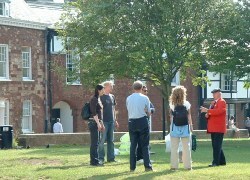 The museum houses far more than Exeter's local history. It also hosts displays of world natural history with some great zoological presentations. There are collections of ceramics, silvers, fine arts, and antiques and much more... Altogether the Royal Albert Memorial Museum is custodian to over one million objects from all over the globe with only a percentage of this prestigious and precious collection on permanent public display. RAMM is also regularly hosting events and visiting art & themed exhibitions with three galleries of changing displays. Keep a check on the Exeter what's on calendar to see if a Museum event has been added. You'll need to check the details, times etc.